Miss Joanne, Maddie and her friends had a garage sale to raise money for the Meisha's Hope Fund this weekend. They were able to raise $3000. Awesome! Meisha's Hope was started by Miss Joanne after their doggie Meisha died. 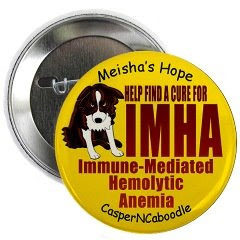 I posted about Meisha's Hope before coz Mommie is also helping them raise funds to find a cure coz this is one of the diseases I have. We sent them a bunch of these buttons so they can give them away at the garage sale to help raise awareness. 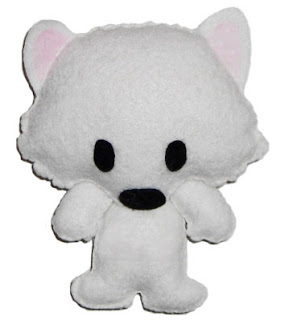 And Mommie sent Maddie a mini version so she can also have a button to wear. Miss Joanne said Maddie wears it on her collar. 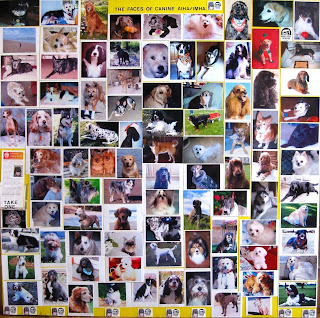 They created a Faces of Canine AIHA/IMHA Board to display at the garage sale. My picture is there right beside Meisha. They said the board was a huge hit. People spent so much time looking at it and they were able to inform lots of people about AIHA/IMHA. You can click on the picture to make it bigger. Also grandma is coming from Manila this weekend. I am so excited! We watched the Manny Pacquiao vs. Ricky Hatton boxing match at Mommie's friends' house on Saturday. They are super nice. They always let me come to their house for get-togethers and even their Grandmas and Granpa pet me and talk to me. Josh is super cute. Mommie gave him a treat to feed me and he was so happy when I took it from his hand. Too bad that was the last treat Mommie had in her bag. Next time she'll bring more. It was his birthday last week so we brought him a gift. They used to have 2 Labrador Retrievers. One yellow and one black. I went to the spot where they usually slept and sniffed to find them but Mommie said they have both gone to the rainbow bridge already. Sniff! Now there is no doggie for me to follow around the house. They had tons of other visitors there. It can get quite scary though with all the kids. I love kids but sometimes they get too excited and will have me cornered and they all try to pat me or hug me at once. When that happens, Mommie rescues me by picking me up and letting me sit on her lap. That way they can pet me one at a time. Good thing the match ended quickly coz I get scared when they all start shouting at the TV. Mommie tries her best to calm me down but I want to run away when they start shouting. Manny won so they were all happy and giving high-fives all around. I was happy too coz that meant the shouting was over. Haha! The last time we watched a boxing match was at a different place. There were no kids around so I did not spend any time on Mommie's lap so I had more time to investigate all the rooms. But as soon as the match started, everyone also started shouting at the TV so I tried to run upstairs to the kitchen to escape. I've noticed they don't shout as much during Superbowl games.